Do you remember this? I sure do. I remember the days of quick instant oatmeal eaten on the fly just before school. The dinosaur eggs were the best, because after they dissolved, you got a mouthful of sugary bits. Now that we are adults, sometimes all we want is a simple, healthy breakfast, void of processed sugars. Oatmeal is good for your heart, and, it’s easy to make. I used canned peaches because fresh peaches weren’t quite in season yet, but when they are, I will be all over that. There’s nothing like a fresh peach in a delicious bowl of oatmeal. Either way, this is a great quick, healthy, and tasty recipe that you’ve got to try! Add the almond milk to a medium sized sauce pan and heat to a boil on medium high heat. Because we are using almond milk (or any milk) you will need to constantly stir to make sure the milk does not burn or boil over. Once the milk is boiling, add the oats. Cook for about 5 minutes. Add one serving to a bowl. Top with 1/5 of the can of peaches (syrup drained). Add extra almond milk if you wish. 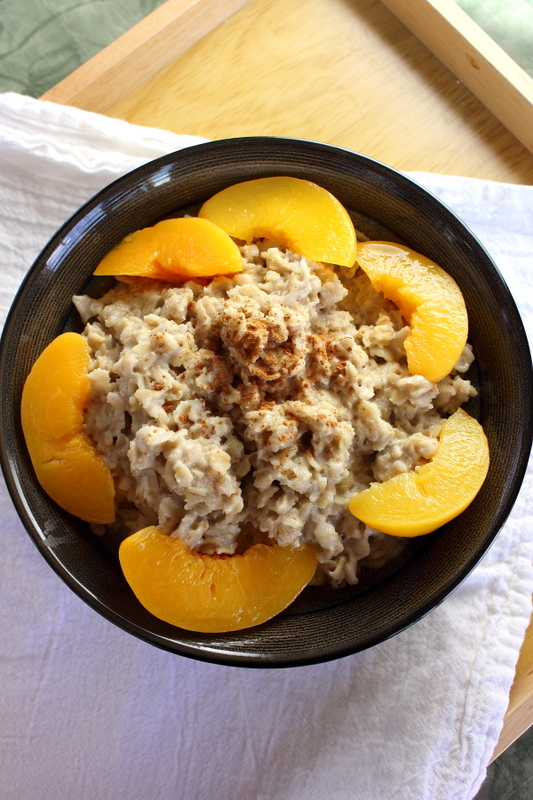 Will you have your peaches and cream oatmeal during the week or for brunch? Let us know in the comments section!